Popupmailers.co.uk Wheel Charts and Slide Charts are usually two discs (although you can have more) joined together by a metal eyelet, available in a variety of sizes and styles to offer product information and sales and marketing solutions. The top disc typically has more windows and as the user turns the wheel the sections of information become visible. Customer and end user interaction ensures that the information on your data wheel is absorbed. 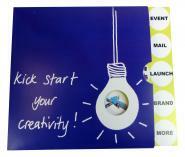 A Lever Chart, Slide Chart or a Slide Rule is another way to spread a marketing message or pass on information. Once again physical interaction either by moving a lever up and down or sliding a card gains optimum focus to your information. These are first class products for easy reference and taking complications away from product specifications and calculations. Whilst the Lever Calculators, Slide Charts and Slide Rules are business-like you can easily design them with a more flamboyant feel for a more attractive appeal. 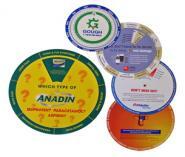 Recycling information and instructions are a very popular use for the wheel charts, along with Parking Discs and Parking Permits all of which feature a hard wearing outer cover. 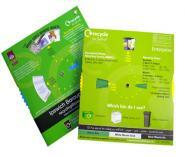 The Little Big Card information leaflet is one of the many popular mini booklet designs from Popupmailers.co.uk. Although easily transported in a pocket, purse or wallet these mini brochure products have a phenomenal amount of print area when opened out. 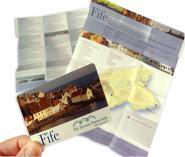 This makes it a top choice to design as an information leaflet for the tourism industry, universities and holiday camps. These are just a few successful examples. 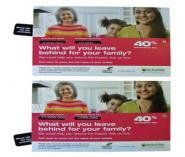 The Carry and Keep Card is very similar in design and both are available in A7 size. The Little Big Card can be produced as a credit card sized mini booklet and compliments the Mini Starburst, Foldilocks and Double Starburst products as the best wallet-sized range for carry and keep information leaflets.